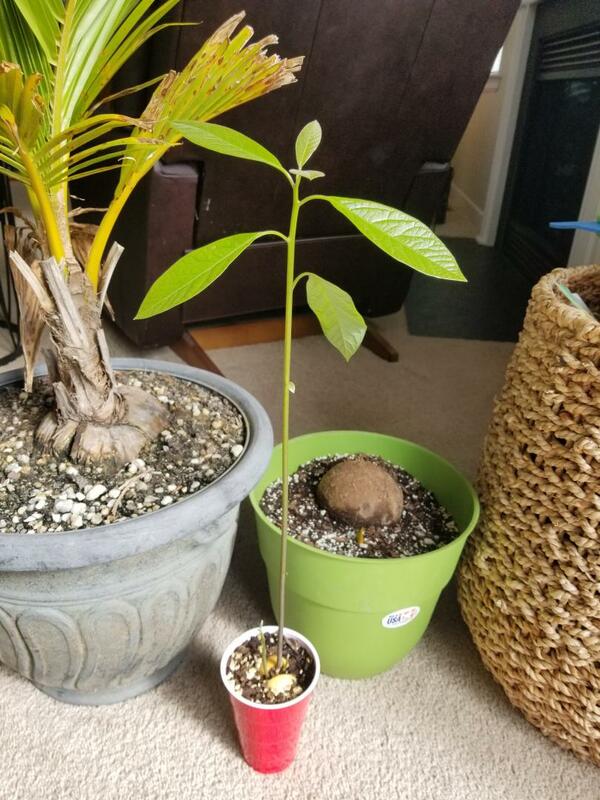 I grew this avacado tree seedling and put it in dirt about a month ago, which is when it sent up its first leaves. In that time it did not get a lot of sun, sometimes only 30 minutes a day of sun actually shining on it. My question is, do the seedlings usually get this tall before they really start to grow leaves, or is mine really stretched out? Mine is the same way. I have two one is more stout and the other is about as tall as yours. It's normal nothing to worry about. If they got more light the stems would not be stretched out as much. You should put it in a bigger pot, but be careful as avocado roots are very brittle and break easily when disturbed. 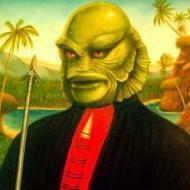 It is nothing to worry about true, but yes it is certainly stretched by lack of light. If it had grown in full sun it would have leaves close to the seed and a much thicker stem. Logical when you think about it. It's a rainforest tree, it will respond to light. If a seed falls under a dense canopy, it will aim for light asap. Yours thinks it's under a dense rainforest canopy. Under established avocado trees we see this all the time; self-sown seedlings under the canopy are tall and thin, seedlings outside the canopy are short and fat. If this is going to be an indoor tree you shouldn't have any issues. I have clipped off the top half before when I wanted to thicken the stem and get a hardier, bushier, plant. This is easiest to do when young as it is still working off the seed. But yours looks great! I recently acquired four Adonidia merrillii seeds, and five Leucothrinax morrisii seeds. I have NEVER tried to grow palms from seed before, but have always wanted to try it. I confirmed that they are viable using the "float test", and now I am attempting the "ziploc bag" technique; the Adonidia seeds are each in their own baggie, and all five Leucothrinax seeds are in the same bag. The soil they're in is a mixture of a pearlite-based mix and the Miracle-gro "Cactus Palm, and Citrus" soil (I also grow cacti and citrus). I added some water to each, and they are now under a heating pad in a tray. I am using a thermometer to monitor their temp, and they have been sitting at around 80-90 degrees since they were placed there. Given that I have never grown palms from seed before, I am open to any suggestions or recommendations as to what I can expect or should do. I know that palms can take time to germinate, so I am hoping to see results by the end of the month, or at least before the end of winter (I am in NE Ohio, zone 6b, so it's cold outside right now). The Adonidias were planted on the 1st, and the Leucothrinax were planted on the 6th. Again, any recommendations or tips are greatly appreciated. Thank you. I later dumped the remainder of the soil out of the pot to reuse it and (to my surprise) the seed + a ridiculously strong tap root appeared with a peculiar white offshoot. I’ve had a Sabal minor stall out and die to the ground before coming back months later, but the new growth was out of the original growing point. I’ve never seen this before. You’d think the year+ old seed would’ve used all of its energy by now, but I guess there’s still gas in the tank. I hope it makes it through the winter. This Sabal minor seedling has seemed to be in a slow decline for a long time now. First the spear turned brown and it stayed that way for like four months. 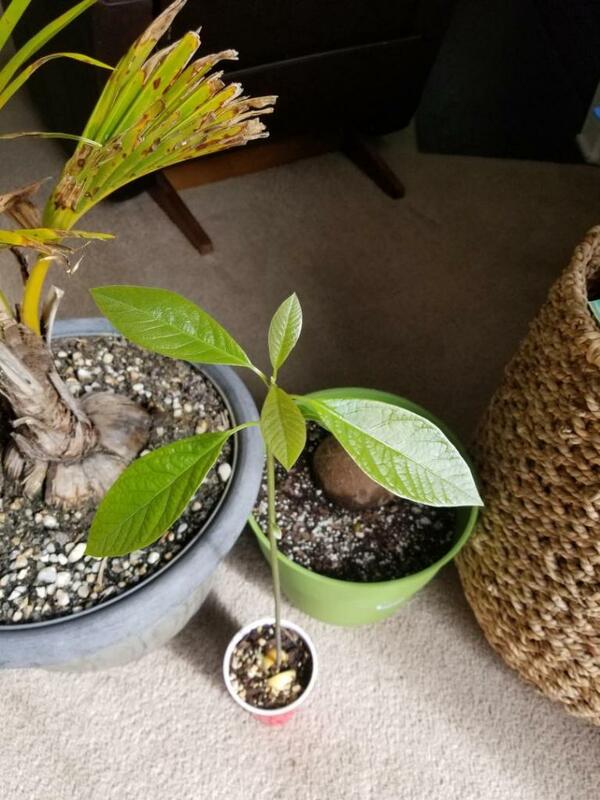 In that time I have repotted it three times with different soil, watered it a lot less than when the spear first turned brown, and gave it lots of light. It just won't grow. The spear seemed to move up a few centimeters at one point, but that is all. Just today I noticed one of the strap leaves starting to shrivel up, which is something that I have seen in Sabal palmetto seedlings that I dug out of the ground in South Carolina due to transplant shock, although it has been more than a month since the last time I repotted it. All of the other Sabal minor seedlings I have are doing completely fine given the same conditions, they have the exact same soil, light, and get the same amount of water. Does anyone know what I could possibly do? Right now the only thing I have done was pour a tiny amount of 3% hydrogen peroxide down the spear every week or two to hopefully prevent more rot. I really don't want to lose this palm. In the picture, it is the palm in the very middle. Just watered, I gave it a little.